The second-biggest source of revenue for the industry comes from the paying public, accounting for 24% of total known news-related revenue, according to Pew Research estimates. This includes circulation revenue as well as license and retransmission fees, which also come out of consumers’ pockets in the form of cable bills, along with individual giving, typically to noncommercial media outlets. 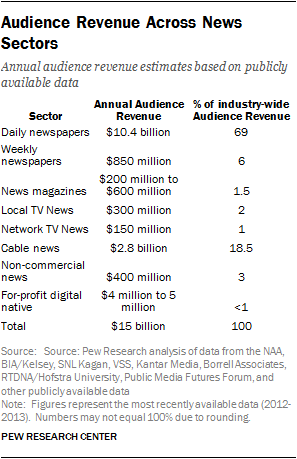 Most audience revenue comes from daily newspaper circulation. Print and digital revenue combined came to $10.4 billion in 2012, according to Newspaper Association of America figures. (To date, the industry has not released digital subscription revenue figures as a category, although some individual newspapers, like The New York Times, do). That number amounts to 69% of audience revenue tied to American newsgathering. In total dollars, it is also a number that has begun to grow, after years of decline, as newspapers have experimented with new pricing strategies for print editions and implemented digital subscription plans. It is now estimated that around 500—and possibly more—U.S. dailies have implemented or are planning to implement such a plan. Aside from newspapers, the biggest slice of audience revenue in the news industry comes from the monthly TV bills —cable, satellite and the like—paid by 100 million American households (a number that has tapered off recently). In recent years, local TV station groups and the major networks have negotiated similar agreements with cable providers whereby they receive a fee for service that is charged to cable customers. Known as retransmission fees, this new revenue stream is the first significant supplement to advertising that the broadcast TV sector has seen. VSS estimates that 3.6% of broadcast TV revenues derive from these fees.13 To provide an estimate of how much money this amounts to for news, Pew Research calculated an additional 3.6% on top of the 2012 ad revenue figure. This amounts to about $327 million. Slightly less than half that amount is then paid to the parent networks, leaving about $176 million in additional revenue to local station newsgathering efforts. Aside from retransmission fees, which have been growing rapidly and are projected to continue growing in the coming years, at least one local TV station—Cincinnati’s WCPO.TV—has begun charging for access to its digital video stream, though the total dollars there at this point are negligible. A number of for-profit digital native news operations have begun experimenting with digital subscriptions. Andrew Sullivan’s website, The Dish, does not host advertising, but through $20 annual subscriptions, the site generated $875,000 in 2013. The Honolulu Civil Beat, launched in 2010 by eBay founder Pierre Omidyar, charges $10 per month for access, and is supplemented by advertising revenue. Some specialty sites, offering premium content to users willing to pay higher fees, charge more. (Revenue estimates for these are not included in this report, which focuses on news for a general audience.) Politico Pro, launched in 2011, offers policy analysis and news for packages that start at $3,295 per year. Business Insider and Capital New York operate such higher-cost subscription services that, even with a small subscriber base, could become a significant pillar of these web-based business models. There is no complete accounting of the number of for-profit digital news outlets that have adopted subscription models, but total revenues are likely small at this stage. Even among the largest entities, the total dollar amounts are small relative to other revenue streams and a survey of hyperlocal news publishers suggests the smaller local outlets do not boost the total in any significant way. Only one out of 44 hyperlocal for-profit sites surveyed by McLellan said that subscriptions accounted for at least 50% of their site’s total revenue. Legacy print magazines and some nondaily newspapers draw audience revenue, too. Among weekly newspapers (many of which do not charge for their papers), subscriptions bring in about 24% of overall revenue, a slight increase over past years. And VSS estimates that somewhat less than half of the revenue for consumer magazines —a category that includes a small cohort of legacy news publications— is derived from subscriptions, both print and digital.